Russia’s President has praised soldiers combating what he called, ‘Georgia’s cowardly aggression’. Dmitry Medvedev says the crime against the entire ethnic group in South Ossetia won’t be left unpunished. “The world has now seen that even in our time there are political freaks who kill people to achieve their selfish goals and who compensate for their lack of intelligence an a most terrible way by destroying an entire people. We will make sure that this crime is not left unpunished,” he said. The Russian President made the comments during his visit to the North Ossetian capital Vladikavkaz. He awarded medals to servicemen involved in the conflict and promised financial help to the families of troops who had been killed. He said the conduct of the operation proved the military had become stronger and more efficient, and he promised further funding to upgrade the army. 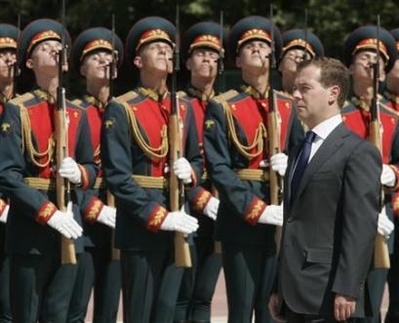 Earlier Medvedev said Russia does not want to worsen international tensions, but does want to be respected. He warned that any aggression against Russia’s people or interests would be met with a firm response. Death is a thing only cults worship.